We've reached the end of the automotive Internet, my friends. Someone switch off the lights on the way out. You see, what we have here is one ludicrous, but sort of apt pairing of vehicles. And I can't look away. 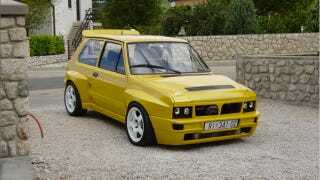 The plan: Take one Lancia two-liter, turbocharged 16-valve, put it in a Yugo, box the fenders and give it the face of a Delta Integrale. That makes it sound easy, but it wasn't. If you can read Croatian (and even if you can't), check out the build thread. It's a hell of a mix, to be sure, though the Delta was largely a Fiat Ritmo, which was sold in the US as the Fiat Strada, which shared its front-wheel drive running gear with the Fiat 128, as did the Yugo. So you see? One big, happy family of lovingly prepped and worked-over shitboxes. And we love them.